Ditzy Doodles has been busy in the background, working towards gaining her Makaton Friendly Status. 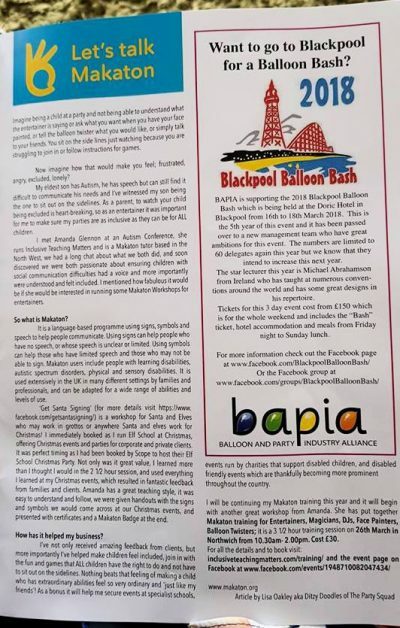 She has attended 2 training session already, one in late 2017 to prepare her for Christmas events, and a recent one geared towards Children’s Entertainers, face painters and balloon twisters, and is working towards her Foundation Training in May 2018. It’s super important to me to ensure that all our parties are as accessible for all children who attend. The Christmas event I entertained at for Scope in Halton was well received by families who attended, feedback was great, it made such a difference to children who attended and not feel like they have to sit on the sidelines, they were engaging with what was happening in the show. Nothing beats that feeling of making a child who has extraordinary abilities feel so very ordinary and “just like my friends!”. It truly makes a difference! 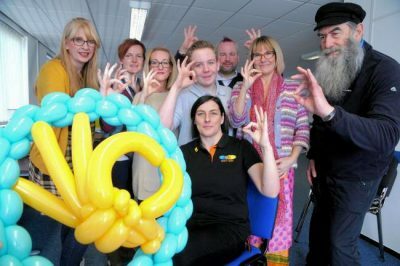 Ditzy intends to not only train in Makaton but also BSL to ensure all children feel included at parties and events throughout Cheshire and Merseyside. As coordinator for Scope’s Face 2 Face Halton service, I would like to thank you for our recent fabulous Elf School Family Christmas Party! The kids had lots of fun and loved to take home their speical medals and certificates. In particular, thank you for your efforts to be inclusive and understanding of the different needs and disabilities, allowing the families to have fun in a relaxed environment. Photo: Northwich Guardian – click link below article for details.